Hope to see you all for touring Danish band Himmerland, featuring special Scots singer Mairi Campbell. Click here to read our latest newsletter. March Concert – Black Eyed Susie – and other music events. 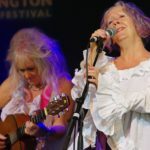 A special evening with the 2019 Tui Award Winners – Frank Burkitt Band on Feb 8. 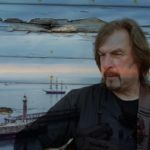 Click here to read our newsletter for more details, and find out about Dale’s house concert with Dennis Duigan and Ramblin’ Ash from Australia. 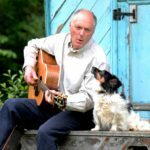 The November concert will be a delight – our local members entertain us with bluegrass, folk, blues and country covers. Click here to read our newsletter and about all the other events. Our October newsletter is coming soon – click here to read. produced eighty plus television and radio soundtracks from 1988 to 1996. Cuba and Brazil, he also has a flair for Latin jazz and Afro-Cuban music. artists such as Donny Hathaway, Billy Withers and Al Jarreau. Michael is also author of newly published thriller Eye of the Songbird. Reviews are glowing: He talks about his book at Te Takere on Saturday 11 August, 2:30 pm. comes head to head with economic survival. SPECIAL NOTICE: The AGM of the Levin Folk Music Club Inc (LFMC) will be held on Friday, 3 August 2018 at 7.30 pm in the Scottish Society Hall, Bartholomew Road. Supper to be served after the AGM, followed by a jam if members wish to stay. Subscriptions are due 30 June, 2018 or at the AGM. Please note that only financial members are eligible to nominate or vote in elections, and to discuss and vote on motions. 1. If any financial member wishes to bring a motion to the AGM, it must be in written form, signed and seconded by a financial member of Levin Folk Music Club Inc. and provided to the secretary by 20th July 2018. 2. 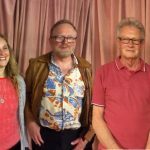 If any financial member wishes to bring a motion to the AGM to amend the constitution, it must be in written form, signed and seconded by a financial member of Levin Folk Music Club Inc. and provided to the secretary by 20 July 2018. Please note that there are nomination forms for chairperson, treasurer, secretary and committee members following the 2017 AGM minutes in this email. Present : Jeremy Cooper, Anne Campbell, Andrew Salter. Chris Lloyd, Barbara Lucas, John Gray, Martie Gray, Cavan Haines, Dale Webb, John Jenkins, Val Jenkins, Paul Webster, Simon Critchley, Kevin Watson, Keith Heginbotham, Colin Brown, Jean Hollis, Charlie Boyce, as well as visitor Norm Daniel. Welcome: Colin Brown welcomed the members and visitors. Apologies : Alastair Pain, Rona Cooper, Jenny and Rod Cavaye, Jo Sheffield, Glad Passmore,René and Renée Van de Weert. Previous minutes :Dale moved that the minutes of the 2016 AGM be accepted as read and approved. Seconded Cavan Haines. Further discussion follows under General Business. Treasurer’s report : Val presented her two reports – a detailed report and a summary report, both of which were accepted as read. She moved that these reports be approved. Seconded by Cavan. Colin thanked Val on behalf of all the committee members for the great detail she went into on behalf of the club in providing the financial report. Dale is resigning from the committee, however will continue to arrange bookings and liaise with performers, and promote the club on the website and on Facebook. Dale (together with Colin) does a wonderful job to keep members up to date with local music events. She will also continue organising and promoting house concerts which have met with recent success. Jean thanked Dale on behalf of all the club and presented her with a small gift (a cyclamen). There were no nominations for the position of chairperson. For the past year the committee has elected one of its members to run each meeting, and at this stage will continue to do so. Jean Hollis was the sole nomination for secretary and was elected unanimously. Val Jenkins was the sole nomination for treasurer and was elected unanimously. John Jenkins and Cavan Haines have all been nominated for a further year on the committee. 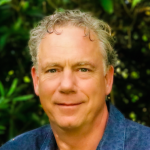 Colin Brown will continue as editor of the monthly newsletter. Motion: There was one motion to be considered by the meeting, relating to the guidelines for the member floor spots, which had been previously circulated to all members.There was a question from the floor about whether the guidelines should include a statement about whether a performer could appear more than once in the course of the year. Members felt that it was probably not necessary to include this specific detail. On some occasions it is possible that a particular member could be part of more than one group performing in a floorspot. So far this has not occurred and it will be left to the committee to decide on appropriate action if this is required. The members also discussed whether a performer should be permitted to use pre-recorded music as part of their item. It was pointed out that it could take extra time to set up in some cases, although this has not occurred so far. It was agreed that with changing technology this is something that will be requested in future and the committee should be aware of this possibility. The motion “ that draft guidelines for member floor spots be approved and displayed on our website” was moved by Colin/Seconded by Kevin. 1. Venue: In the course of the meeting the new chief of the Scottish Society had been asked to provide the most up-to-date statement on the situation with the hall. Chris Hartwell reported that their Society was going to make repairs to the roof initially. This should have been done in July but bad weather had prevented the work getting started. Following their forthcoming debutante ball, the new committee were to develop a five year plan which would aim to increase membership, form stronger relationships with other Scottish clubs and generally lift their profile. The hall is a focal point and an asset which they wish to continue to use. Our members questioned the security of the hall, the current rental, the fire extinguishers, lack of alarms and sprinklers and the general state of the hall. Chris had already mentioned the condition of the carpark, and asked that the new committee should provide him with a list of all the aspects that we felt needed attention, so that he could bring these to the attention of his Scottish Society which he expected would go ahead and make alterations/repairs. He also said that their Society was keen to maintain good relations with groups like the LFMC and that the club would be informed if there were any changes made which could affect us. Dale gave the meeting a full report on the RSA as a potential venue. It is a very comfortable site, and with the use of the bi-fold doors it is easily separated from any other activities happening there. Any events in the restaurant or other social areas are usually finished soon after 7 pm, so unlikely to intrude on a folk club concert. The bar could be available until perhaps 8.30pm if we wished to make that arrangement, but this was not obligatory. The RSA has a suitable stage, lighting, and is conveniently central with very good parking. The club would be able to use two very spacious storage rooms, as well as the kitchen which has a dishwasher as well as the usual cooking facilities. There is also the potential for the club to gain new members simply from the foot traffic that is likely to pass through the RSA. Issues needing to be further examined were whether any sound from outside might interrupt performances, and the fact that the RSA is not really a economic site to hold the club night, which normally has fewer than 20 attendees. Some members expressed concern about the loss of tradition should we move to a new venue, although others noted that when a move was made many years ago from a site in the town to the Scottish Society Hall there was no major change in attendance.The members suggested that the club should try having the November concert at the RSA to see how it worked as a venue. The committee will go ahead with this plan and ask Dale to make the booking for us. Over the past year we have been aware that the money collected at the door on concert nights has never been sufficient to pay the performers 60% of the door take, and they have always received payment of a lower amount which we provide on our sliding scale. While we do still receive requests from bands to play on our concert night, Dale is having to “chase” others, and she is conscious that perhaps they are drawn to other clubs where payment is higher than what we have been offering. In Dale’s research into what other clubs charge their members, it is clear that they all charge at least $10 and often more. In the two house concerts we have had, the audience had all been willing to pay $15 entry, and this meant that the performers received a good recompense for their entertainment. It was also felt that the audience numbers have dropped a little this year, although it was pointed out that this is probably because there is a lot more on offer these days and people were making choices depending on their interests and their income. For the reasons given above, Dale would like to see our door charge raised. Jeremy said he would prefer that we use some of our club funds if we felt we needed to pay more to performers, rather than increasing our door charge. The committee will look at our current sliding scale and see whether we think we should pay more to the performers. 3. Newsletter. Chris gave a vote of thanks to Colin for the outstanding newsletters that he produces each month. These are really appreciated by all members. 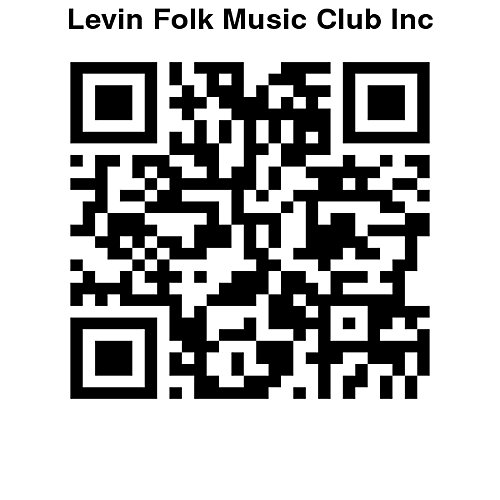 Nominations will only be accepted from financial members of the Levin Folk Music Club Inc. Nominated by (name) …………………………………. (signature) ……………………………..
Seconded by (name) ……………………………. …(signature) …………………………………. In signing, the nominee accepts the nomination, and if elected pledges to act in the best interests of the club at all times. The nominee must be a financial member of the Levin Folk Music Club Inc.
Positions will be for one year commencing after the AGM. Seconded by (name) ……………………………………….. (signature) ………………………………..
Members and musos are invited to play at the June Mid-Winter concert. It’s free and not at the Scottish Hall!! Click here for the June newsletter. The AGM is set for 3rd August, forms will be sent out by email and will be available in the Downloads. Looking forward to a great evening April 13 with members of the Wellington Bluegrass Society. Click here to read about Club happenings and things to come.